In order to properly understand why we need to control erosion, we need to know what erosion is. Stated simply, erosion is the process of wind or water deteriorating the land -- but let us explore this idea a little more. Wind can blow dirt and sand around, shaping the landscape; water can dislodge rocks and other material, carrying them to a new location. Heavy rainstorms can also create rills or gullies in the earth's surface. Additionally, water can change its state and erode an area. For example, there is Glacial Erosion. Erosion control is the attempt to limit land damage that is a result of erosion, which may occur naturally (from wind and water) or unnaturally (from human interference). The types of erosion control measures may be broken up into three categories: natural or organic based, unnatural or inorganic based, and vehicular. Erosion control measures that are natural or organic based are efforts to protect the earth's surface through materials that come from the earth. These materials can be plant based, water based, or rock based. There is an abundant amount of plant based erosion control measures. Buffer strips are similar to bioswales (see below) as both control running water and contain loose sediment. Buffer strips are usually found on farmland and are made up of permanent plants (which means a farmer will not strip the plants and grow new vegetation in their place) -- bioswales, on the other hand, are entrenched into the land. Alternatively, there is an erosion control measure called windbreak. Windbreaks have the same purpose as buffer strips but are made up of bushes and trees rather plants. Crop rotation is growing a new type of crop in a field each year to help fight soil erosion. Reforestation means to replant trees in an area where they have been cut down. Not only does growing new trees help fight erosion, but trees also provide us with fresh air. There are two types of seeding (temporary and permanent) and a seeding method (hydroseeding) that help control erosion. The purpose of these two types of seeding is to grow plants that will help protect the soil from erosion. Seeding is much like mulch, which can be used in conjunction with seeding. Temporary Seeding. This is seeding that is used during quick construction jobs or until permanent seeding is able to be planted. The time of year may prevent permanent seeding. Permanent Seeding. This is seeding that occurs after construction and is done in order to provide the land with lasting protection against erosion. Hydroseeding. Hydroseeding is a method of seeding and can be used for either temporary or permanent seeding. It is employed when the land is difficult to access (a steep slope, for example). With hydroseeding, seeds are sprayed onto the ground either through the use of a truck or helicopter. A similar concept to seeding is cover crops which are crops made up of strong plants compacted together to help prevent the soil from eroding. 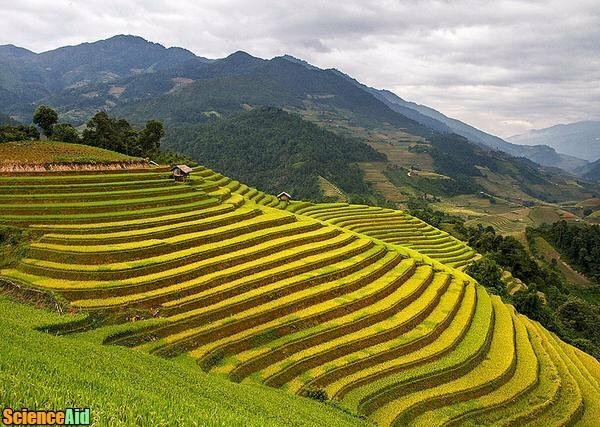 Terracing is much like contour plowing (see below) as it helps prevent soil erosion by having multiple (soil) barriers, or in this case "stairs," perpendicular on a slope. This construction slows down water, preventing the formation of small streams and the displacement of rocks and minerals. Here are two water based erosion control measures. Bioswales are also called grassed waterways and vegetated waterways. Bioswales are like trenches that have vegetation along the bottom. They guide water through areas and help contain loose rocks and pollution. While impoundments do not stop erosion, they help control erosion that has already occurred. They are human-made water basins, and their purpose is to contain soil and other materials that move around as a result of water erosion. Retention Basins/Ponds. These are permanent basins, and they are designed to gather water runoff from all the areas around it. They also help prevent flooding. Detention Basins/Ponds. These are temporary basins and are also called retarding or sediment basins. They are smaller and are often used during construction to control where water moves soil and other minerals. Riprap. 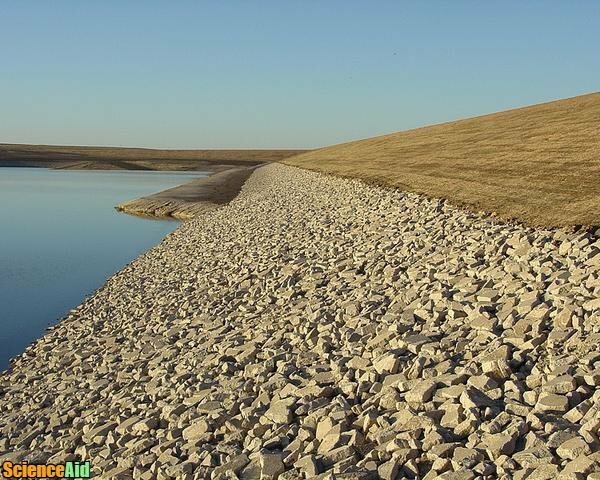 Riprap is a rock based erosion control measure and may also be called shot rock or rock armour. Ripraps are made up of rocks and prevent water erosion by covering and protecting shorelines. Unnatural and inorganic based erosion control measures are methods of protecting the earth's surface through the use of materials that are not natural or organic. They are human-made materials. Fiber rolls are similar to terracing; however, fiber rolls are used in construction areas, and instead of being soil barriers, they consist of straw/coconut fiber. Additionally, they are temporary. Fiber rolls are placed on slopes to manage displaced sediment that may contaminate a water source. Sand fence is also called sandbreak and is used to catch sand that is being blown around by the wind. Silt fences a made up of geotextile (which is a filter fabric). These fences are used to contain soil within construction sites as rain water may cause the soil to run into other water sources, such as rivers and lakes. Turbidity curtains are similar to silt fences as they also consist of geotextile. Unlike silt fences, they are placed in water to can catch sediment. They are used during construction. Vehicular erosion control measures are measures to control erosion through the use of vehicles. 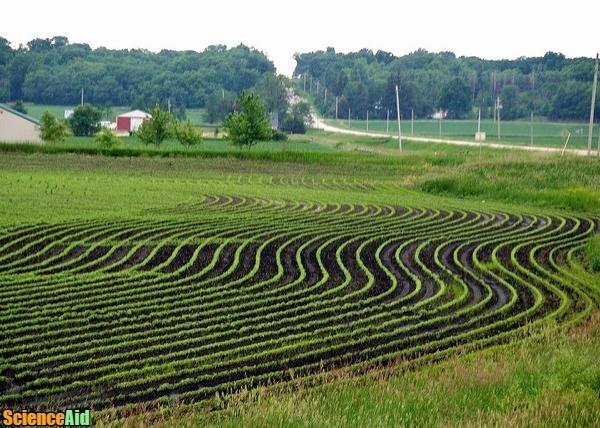 Conservative tillage is a soil cultivating method and an alternative to conventional tillage, which is more harmful to the environment as it removes the soil's protective barrier of leaves and plants. Conservative tillage, on the other hand, has a reduced amount of soil disruption as it preserves about 30% of the plant barrier. Contour plowing is also called contour bunding, contour farming, or contour cropping. With contour plowing, farmers plow according to the landscape's contour lines. Plowing in this way prevents water from eroding the soil as the plow lines slow down water from heavy rains, preventing water from creating ravines and small streams. A subtype of contour plowing is strip contour cropping, which is also called strip farming. Strip contour cropping is plowing that follows the contour lines of the landscape but also alternates between the seeds that are planted in each line. This method is used to protect weak plants and soil by growing stronger plants around the delicate ones. Gravel access paths are paths that are covered in gravel in order to help prevent a vehicle's tires from carrying soil into "foreign" areas both inside and outside the work site. 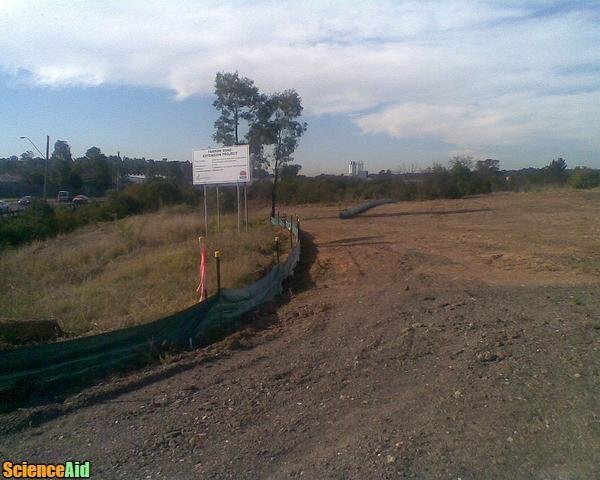 MLA (Modern Language Association) "Erosion Control Measures." ScienceAid, scienceaid.net/Erosion_Control_Measures Accessed 20 Apr 2019. Chicago / Turabian ScienceAid.net. "Erosion Control Measures." Accessed Apr 20, 2019. https://scienceaid.net/Erosion_Control_Measures.